Figure 3(a) indicates the energy diagram of a bulk heterojunction solar cell in open circuit condition. The Evac of the different materials are aligned as explained above, and no electrical field is present within the device. Figure 3 (b) represents the short circuit condition. The Fermi levels of the two electrodes align themselves and a built-in field appears in the bulk, resulting in a constant slope for the HOMO and LUMO levels of the donor and acceptor (respectively, HD, LD, HA, and LA) and for the Evac. Fig. 3. MIM picture for a polymer diode under different operating modes. (a) open circuit condition, (b) short circuit condition, (c) forward bias, (d) reverse bias. When polarized in the forward direction (high work function electrode (ITO) connected to (+) and low work function electrode (Al) connected to (-)) as in Figure 3 (c), electrons can be injected from the Al electrode to ITO electrode and holes from ITO electrode to Al electrode. The effective field in the device will ensure the drift of electrons from Al electrode to ITO electrode and hole from ITO electrode to Al electrode. 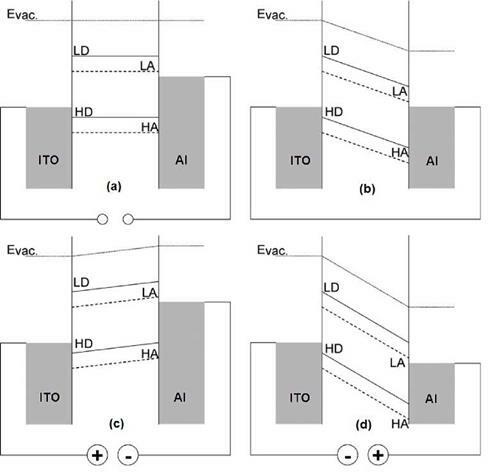 Finally, when the device is polarized in the reverse direction (ITO connected to (-) and Al connected to (+)) (Figure 3 (d), charge injection is hindered by the field present in the device (Dennler & Sariciftci, 2005). where Impp and Vmpp represent the current and voltage at the maximum power point (Pmlx) in the fourth quadrant, respectively (Figure 4).